Kauai is blessed with an abundance of tropical beauty and more sandy beaches than you can explore in a month. It is a sublime place for your honeymoon or romantic getaway. Kauai has a relaxed and quiet way of life, that will make it the perfect spot for honeymoon memories that will last a lifetime. Kauai's possibilities for a wonderful Hawaii honeymoon are nearly endless; you can snorkel in clear water amid a blizzard of tiny reef fish, explore an enchanted landscape of dragon backed mountains caressed with fragrant breezes, then dine beside a torch lit garden before your stroll under a billion twinkling stars. Suite Paradise offers specially discounted Hawaii Honeymoon and Hawaii Getaway Vacation Packages featuring top quality condo-hotel beach resorts and carefully selected Kauai vacation rentals. The package also includes a special rental car and reduced prices at many of Kauai's finest restaurants and attractions. Beautiful tropical gardens are available for your Hawaii wedding at any of our Kauai resorts. Hold hands and walk barefoot in the sand. Watch painted skies from your private lanai. Kindle the embers and ignite the flame, as neither of you will ever be the same. Your romantic getaway package begins with an unlimited mileage convertible car rental from Avis. Take a short drive along sunny Poipu Beach, or go as far as the lush tropical rainforests of Hanalei and the North Shore, eventually returning home to your luxurious one bedroom ocean view condo, and an Aloha basket of bakery treats! Suite Paradise’s most popular Hawaii Honeymoon Vacation and Romantic Getaway Packages are shown below. We also offer many other flexible Kauai vacation packages including a wide range in accommodation sizes and types, plus golf, adventure and activity options, and more. Be sure to check out our Kauai Map and Poipu Beach Map and see where our beachfront resorts are in relation to the best island attractions! Our Kauai vacation rentals are highly recommended by travelers. Over 50% of guests are returning visitors and their friends, indicating an astounding level of satisfaction. See what previous guests have to say about Kauai and our vacation rental resorts. 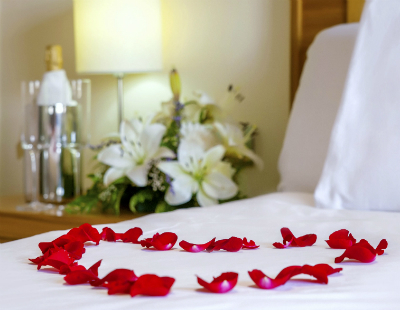 Be sure to check out our special offers or call us for details on our exclusive Honeymoon packages!